Adina Taubman's one-person docudrama, based on interviews that she conducted in Littleton, Colorado, following the massacre at Columbine High School in 1999. Adina has performed the play in many theater festivals, including The New York Fringe, The Edinburgh Fringe, The United Solo Festival, and The Midtown International Theatre Festival, where she received the award for Outstanding Solo Show in 2007. Adina has also performed the play in many high schools in the Tri-State Area. A LINE IN THE SAND is directed by Padraic Lillis (Labyrinth Theater Co). Please go to Adina's website, www.alineinthesandtheshow.com, to learn more about the show and to view the five minute promo. 9MM AMERICA received its world premiere at the Planet Connections Festivity in June. The Huffington Post called it, “fearless, political theater.” They are currently raising money to get 9MM AMERICA into the New York City public schools and community centers. Girl Be Heard’s founder and artistic director, Ashley Marinaccio, is the recipient of the 2013 Lucille Lortel Women’s Visionary Award. To learn more about Girl Be Heard, please go to their website: www.girlbeheard.org. 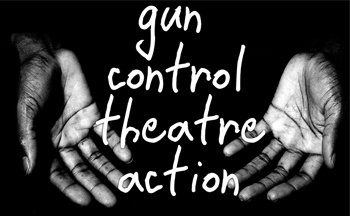 13 Short Plays from the collection, 24 GUN CONTROL PLAYS, by Caridad Svich, Elaine Avila, Cecilia Copeland, Chris Weikel, Yvette Heyliger, Winter Miller, Matthew Paul Olmos, Chiori Miyagawa, Jennifer Maisel, Lynn Manning, Gary Winter, Zac Kline, and August Schulenburg.